We have a welcoming refreshment room serving hot & cold drinks and snacks all day, and also lunches. As well as a selection of Cornish Pasties, Sausage Rolls etc. we serve home made specials such as Cottage Pie, Lasagne, Curry, or Chilli Con Carne - all served with seasonal vegetables and potatoes, rice or chips. Special dietary requirements, such as gluten free, can be catered for if arrangements are made in advance, either by phoning the centre or by dropping into the restaurant earlier in your visit and asking for the Catering Manager. Look out for our Special Deals such as Tea or Coffee and Cake for £3.50. A limited number of high chairs is available to diners in our refreshment room. If you require baby foods or bottles warmed we shall be pleased to help. Enjoy your meal out in our ample picnic area: fresh air and in full view of the trains as they pass by! From pocket money treats to expensive collectables you’ll find a good range of items on sale in our shop. Our souvenir range includes notepads and pens, badges, bookmarks and also a good children’s section. 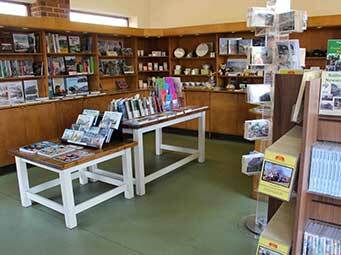 For the enthusiast we offer books, DVD’s, ties and hotel chinaware, amongst other gifts. The toilets (including unisex facilities for the disabled) are located within easy reach of the shop and restaurant area. Wheelchair access is available. Baby changing facilities are available within the disabled toilet. The enquiry office is usually open on running days and is open most other weekends. Call in and ask if you have any questions or if you wish to join the Great Western Society. If the Enquiry Office is closed please call at the Society's Office just inside the Engine Shed. If you need first aid contact the enquiry office or, if it is not open, the Society's office just inside the engine shed. The ‘lost persons’ meeting point is the enquiry office. Well-behaved dogs are welcome at the Centre but they should be kept on a lead. To ensure the comfort of all our visitors please remove any ‘mess’ that your pet may leave behind.